The Sequence Fill dialog box lets you Lets you create a numbered sequence over a selection. The sequence can be forward, backward, single, double or higher increment, as a cycle, and so on. The selection can be over one cell or a cell range in one column or more or an entire column or many entire columns. 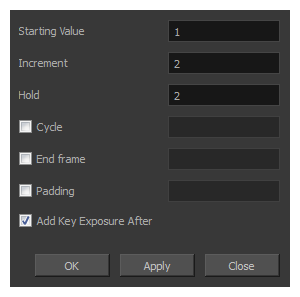 For tasks related to this dialog box, see Creating an Exposure Sequence. The first number in the sequence. Lets you type the number by which the drawing number will increase from frame to frame. For example, an increment of 1 gives you: 1-2-3-4; an increment of 2 gives you: 1-3-5-7; and -2 gives you this: 8-6-4-2. Enable this option to cycle the values and enter the number of cycles in the Cycle field. Enable this option to stop the fill at a specific frame within the selection. 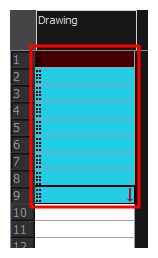 Indicate the frame number in the End Frame field. Enable this option to add a 0 padding before the drawing name. In the Padding field, enter as many hash symbols (#) as digit you want in your drawing name, including the value itself. Inserts a key exposure on the frame following the last cell of the new fill selection.